Infrastructure is at the heart of everything we do. It’s the roads, tunnels and bridges that we use to commute to work, the sewer systems we rely on for clean water, and the electrical grids that power our homes. Over the next several weeks, the University of Washington College of Engineering’s fall lecture series will feature faculty researchers and industry leaders who work to maintain and improve our region’s critical infrastructure. 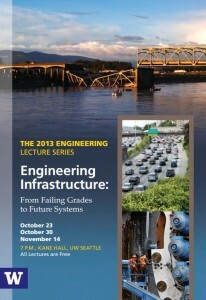 The series of lectures, which is free and open to the public, kicks off next Wednesday (Oct. 23) in 120 Kane Hall with “Failing Grades to Future Systems.” Greg Miller, UW professor and chair of civil and environmental engineering, will discuss the variety of infrastructure we rely on daily and explain why many of our state’s bridges and roads are rated poorly. Paula Hammond, former state transportation secretary and now a senior vice president overseeing U.S. transportation at international engineering firm Parsons Brinckerhoff, will talk about the history of transportation in Washington and options we have for addressing current problems. 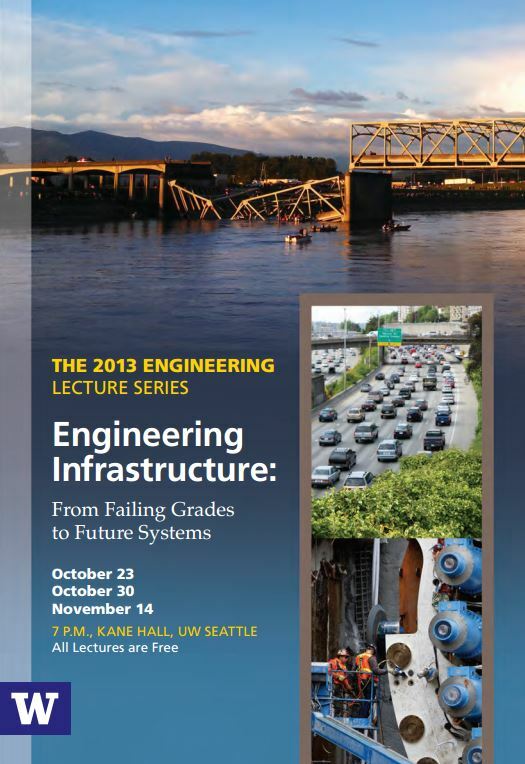 On Wednesday, Oct. 30 in 120 Kane Hall, bridges will take center stage in “Spanning the Gap: Lessons in Bridge Engineering.” John Stanton, a UW professor of civil and environmental engineering, will talk about bridge construction and recent breakthroughs in engineering that have led to shifts in bridge design. Finally, on Thursday, Nov. 14 in 130 Kane Hall, the focus will be on underground infrastructure, specifically, the Alaskan Way Viaduct replacement tunnel and world’s largest-diameter tunneling machine currently working to dig underground. In “Tunneling Toward a New State Route 99 Corridor,” Matthew Preedy, a UW engineering alumnus and deputy program administrator for the state’s Alaskan Way Viaduct Replacement Program, will discuss the enormity of a project that resulted from a decade of public debate. Bertha, the tunneling machine, began digging beneath downtown Seattle this past summer. All lectures are free and start at 7 p.m. Advance registration, either online or by calling 206-543-0540, is required. All lectures will be broadcast at a later date on UWTV.